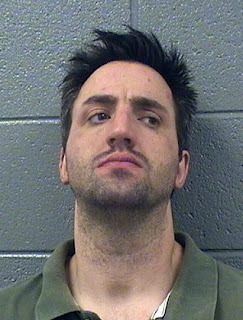 Thomas Thompson, who was charged with disarming and attempting to murder two 20th District police officers after they detained him for shoplifting from an Edgewater Walgreen's in 2015, was found guilty and sentenced to 24 years in prison today. "This didn't happen in Uptown. It was nearby and I thought your readers might be interested in the resolution of a violent incident that had a lot of publicity. The case was followed by both the 19th District and 20th District court advocates. On Valentine's Day 2015, Thomas Thompson, 33, shoplifted vitamins and supplements from the Walgreen's store at Clark & Catalpa (5440 North). 20th District police officers, Joseph Groh and Mark Czapla, happened to be in the parking lot when he left the store. He was followed outside by the manager on duty, Ray Robinson. Mr. Robinson alerted the officers about what was going on, and they tried to stop him. Mr. Thompson is a large man, 6-3 and 250 pounds. He fought with the officers and managed to disarm one of them. He fired a shot at them that missed. He then pulled the trigger 2 more times, but the magazine had fallen out of the gun. It did not fire. Witnesses said they heard him say he wanted to kill them, and the Walgreen's security cameras taped the whole thing. It took 4 men to subdue him: the officers, Mr. Robinson, and another customer who was in his car in the parking lot. Backup units were summoned and 20th District officers arrested Mr. Thompson. Officers Groh and Czapla were hurt and taken to Illinois Masonic. They both required hospitalization for their injuries. One officer testified that he still has pain caused by the injuries he received that night. There was a 3-day bench trial in front of Judge Michael Claps at 26th & Cal. Mr. Thompson was found guilty of 2 counts of attempted murder of a police officer and 1 count of disarming a police officer. Judge Claps sentenced him to 24 years in prison for each count of attempted murder, and 2 years for disarming a police officer. The sentences will be served concurrently rather than consecutively. So it's essentially a term of 24 years. By law, he must serve at least 85% of that sentence, depending on his behavior while incarcerated. That boils down to 20.4 years. He received credit for 773 days time served. He will have 3 felony convictions on his record and will be incarcerated for at least another 18 years. He will then have to serve 3 years of Mandatory Supervised Release. Joy Repella of the State's Attorney's office (Community Justice Center) led the prosecution. Unfortunately, Mr. Robinson passed away of cancer before he could learn of the sentencing. He died a hero, having done much to save the lives of the officers by helping subdue Mr. Thompson after he attacked them." As it was explained to me -- the span for attempted murder for a police officer is 20-100 years. He was found guilty of two of those. The decision was the judge's to give him 24 years for each officer. There is no existing case law for having the sentences run consecutively rather than concurrently, so everyone's hands were tied on that. The defendant asked for a reduced charge that would have had a sentencing range of 6-30 years, and asked for six, plus another year for each officer. It's a longer term than he asked for, but nowhere near the maximum of 100 years. "The most important part of the sentencing consideration was that the guy had no rap sheet. His worst previous crime was violating a restraining order. The sentencing range was 20-80 years. The judge listened carefully to all of the pre-sentencing information. The victim impact statements, the family's side of it, a long statement from Mr. Thompson. The judge thought about it for five days before sentencing. The police officers were happy with it and glad it was over with. From what I know of the law, without caselaw about sentences running concurrently, sentencing like that would have opened it up for appeal and even more years of litigation. Mr. Thompson will be in his 50s when he is out." Glad this is over... We have had contact with Officer Czapla thru 20th District. He's a very dedicated officer. He sets a fine example of a great beat officer. Thank you to officer Czapla and Officer Joe Groh for your commitment to our community. ...all for vitamins and supplements? I think this is a good sentence for this guy. I am just mystified as to why so many gang bangers who fire shots at people are able to walk the streets again in just a couple of years. I think anyone who fires a gun at another person with no justification should spend at least 20 years in prison.